There are times in our lives when we are tired of the bustling city life, maniac crowd and maddening working hours. And that's when to break that monotony and circadian rhythm of the body we need vacations to explore, to stay calm and to rejuvenate. Those who are looking for a relaxing holiday there are no better places than Buddha temples, which can be found in real numbers in India. In these places, you can see how Buddhism is more of a’ way of life’ than a philosophy. And how in daily life, if following his principle, we see ourselves and the world different. Travellers who are looking for such an enlightening experience should opt for the Buddhist Tour with Golden Triangle, offered by Tour My India. 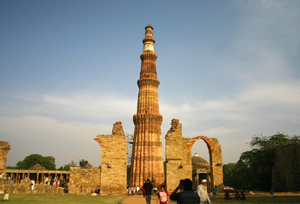 Starting and even ending in Delhi, this twelve days guided tour will take you to all the places that have a strong connection with the Buddha principles and teaching. 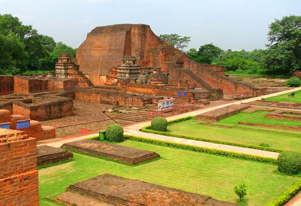 Nalanda, Rajgir, Bodh Gaya, Kushinagar, Lumbini, and Shravasti are places that you will be covering on this tour. 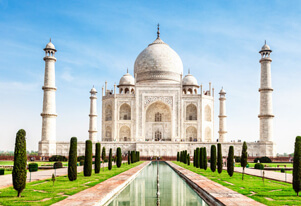 The main highlight of this trip is that apart from the Buddhist pilgrimage destinations; this tour will pass through iconic golden triangle sites – Delhi, Agra and Jaipur. Pick this tour now to travel for a life changing experience. For further details, you can drop an email or simply call us to learn more about our travel deals and incredible tour packages in India. On arrival in Delhi, meet our representative, who will transfer you to your pre-booked hotel. The evening will be free for leisure. Dinner and overnight stay at the Delhi hotel. Today, you will visit Raj Ghat, Shanti Vana, Jama Masjid, Qutub Minar, Humayun Tomb, India gate, and Lakshmi Narayan Temple. During the sightseeing tour, you will pass by Red Fort, Rashtrapati Bhavan, Parliament House and famous Secretariat buildings. Dinner and overnight stay at the Delhi hotel. After breakfast, drive to Jaipur. On arrival at Jaipur check-in at the hotel. The evening will be free for leisure. Dinner and overnight stay at the Jaipur hotel. Today, you will go for a city sightseeing tour. 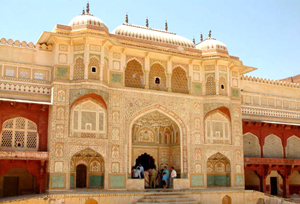 You will visit Amber Fort and City Palace. Drive past Hawa Mahal & through the pink rose residential & business areas. In the evening, you can also go to the market to purchase some handicrafts and apparel. Overnight stay at the hotel. You will visit Taj Mahal as the first thing in the morning and then drive back to the hotel for breakfast. Later, visit the Agra Fort and rest of the day is free for leisure. In the evening, you will be transferred to a railway station to board a flight for Patna. Overnight journey. Upon arrival at Patna, you will be transferred to the hotel. Later proceed for city tour of Patna and see places like Goal Ghar, Stupa of Buddha Temple and Old city of Patna. Overnight stay at the hotel. After breakfast in the morning, drive to Bodh Gaya. En-route, visit Nalanda University, founded in the 5th century B.C. Also, pay a visit to the archeological museum that exhibits the Nalanda University seal, sculptures and other remains found on the site. Later take a 20 km drive to Rajgir. Further, visit Griddhkuta "Hill of Vultures", where Buddha delivered some of his most famous sermons. After that, visit Saptparni caves where first Buddha Council was held which is also the source of Rajgir's hot springs. Later continue drive to Bodh Gaya. On arrival at Bodh Gaya, check-in at the hotel. Overnight stay at the hotel. 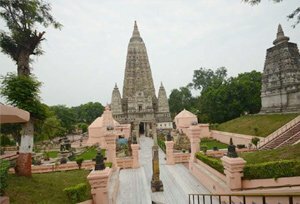 Visit Mahabodhi Temple, which includes tall stone lotuses, figures of Buddha sitting in different postures on the walls, his footprints on the stones and a colossal golden Buddha in the sanctum sanctorum. The Bodhi Tree is situated in the premises of the temple, is the one under which Buddha attained illumination. Another option is to sit and meditate under the Bodhi Tree. Dinner and overnight stay at the Bodh Gaya hotel. Post breakfast at the hotel, drive to Varanasi. On arrival at Varanasi check-in at the hotel. 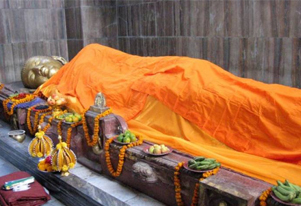 In the second half of the day, visit Sarnath, the place where Buddha delivered his first sermon. After a brief sightseeing tour, visit the ghats to see the evening Ganga Aarti. Dinner and overnight stay at the Varanasi hotel. In the morning go for the famous boat ride of Varanasi. After the ride return to hotel and drive to Gorakhpur via Kushinagar, one of the major Buddhist pilgrimage destinations where Lord Buddha attained Parinirvana or final Nirvana. 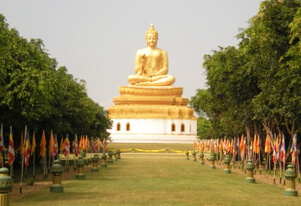 In Kushinagar, visit ancient stupas and modern temples, commemorating the Buddha's death and cremation. Dinner and overnight stay at the Gorakhpur hotel. Post breakfast at the hotel, go for the city tour. Later drive to Balrampur, en-route visit birth place of Lord Buddha - Lumbini. When in Lumbini, visit Lumbini Park, Mayadevi temple, and China temple. After a brief sightseeing tour, continue your drive to Balrampur for dinner and overnight stay. After breakfast, drive to Lucknow. En-route visit Shravasti where Lord Buddha passed the greater part of his monastic life and preached after the enlightenment. Also, we will visit the Ananda Bodhi tree where Lord Buddha meditated for a night then visit Jetavan where Lord Buddha performed some miracle. Later continue drive to Lucknow. Overnight stay at the Lucknow hotel. Today, you will explore Lucknow. Visit Residency complex, Dilkusha Gardens, and La Martiniere, monuments of Avadh Nawabs including the Imambaras, Romi Darwaja and explore Lucknow's colourful bazaars. Later transfer to railway station to board a train for Delhi. Overnight journey. Upon arrival at Delhi, meet our representatives who will transfer you to airport/railway station to connect flight/train for onward destination.